Passing is one of the fundamental skills within netball that can really change a game, therefore it is important your team’s passing is up to scratch. The session begins with a fun warm up focusing your players on their passing to maintain in control of the ball. The warm up will get your players considering what the best type of pass to use is and in what situation. 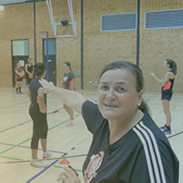 The session provides a detailed visual and verbal description of the correct technique for each of the main passes within netball; it is crucial your players have the correct technique before moving on. ‘Push the barriers’ helps your players to develop their passing accuracy and strength over a range of distances, using different passes for different distances. The drills move onto focus on passing accuracy whilst on the move. The session concludes with a game of netball, with certain conditions placed upon the game to get your players demonstrating what they have learnt. The importance of accurate, strong passing cannot be underestimated within netball. It can control not only the pace of the game but can also decide the outcome.